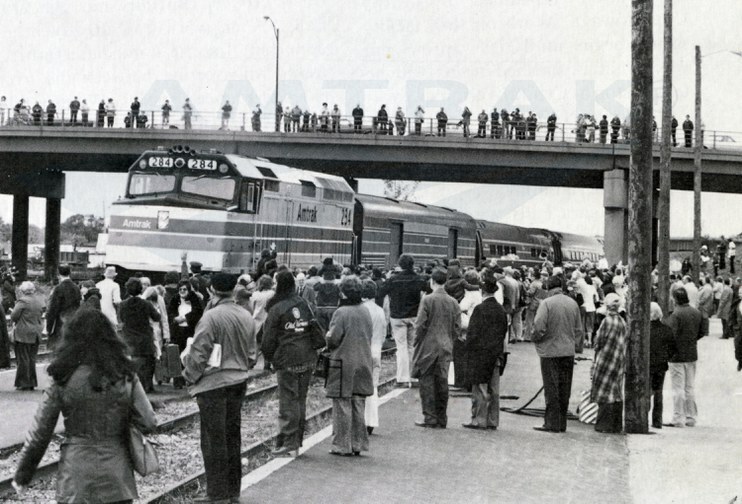 On October 29, 1978, the eastbound Niagara Rainbow (Detroit-Albany-New York) made its scheduled stop in Niagara Falls, N.Y., restoring intercity passenger rail service to the city after a 17 year absence that predated the creation of Amtrak. As the train pulled into the refurbished station off Lockport Road northeast of downtown, it was met with cheers from the assembled crowd of more than 500 onlookers. While many gathered on the platform, others sought an elevated view from the Hyde Park Blvd. Bridge that crosses over the tracks. The eastbound Niagara Rainbow pulls into the Niagara Falls, N.Y. station on October 29, 1978. An hour earlier, the group had gathered in front of the depot to hear speeches by local and state officials including Congressman John LaFalce; William C. Hennessy, commissioner, New York Department of Transportation; and Niagara Falls Mayor Michael O'Loughlin. The Viking High School Marching Band from nearby Grand Island played musical selections, and Amtrak provided sweet rolls, coffee and soft drinks. Visitors were welcome to tour the new station, which had been built as a freight house in 1959 for the Lehigh Valley Railroad. Using one of the old New York Central Railroad stations closer to downtown was not an option, as both had been demolished in 1964, three years after that company discontinued service to the city. A reporter for Amtrak NEWS noted: “One innovation [at the station] is the utilization of the long former freight house to provide direct access to the parked…Empire State Express. Doors in the building were moved to match the location of doors on the train. Passengers will be able to step directly from the train into the heated building…” Once the speakers had taken photos in front of the train, many climbed aboard with members of the press for the next stop at Buffalo’s Exchange Street station, where another ceremony was held. City, state and Amtrak officials address the crowd to mark the start of Amtrak service in Niagara Falls. Amtrak inaugurated service with two daily roundtrips via the Niagara Rainbow and the Empire State Express (New York-Albany-Niagara Falls). The former had recently received new Amfleet equipment, while the latter used RTL Turboliner trainsets. Built by Rohr Industries, the RTL Turboliners were delivered to Amtrak in 1976-77 for use in upstate New York. They were modified from the earlier RTG Turboliner units to include American couplers and standard 480 volt head-end power. To access Grand Central Terminal in New York City, the RTLs were also equipped for third rail electric operation. 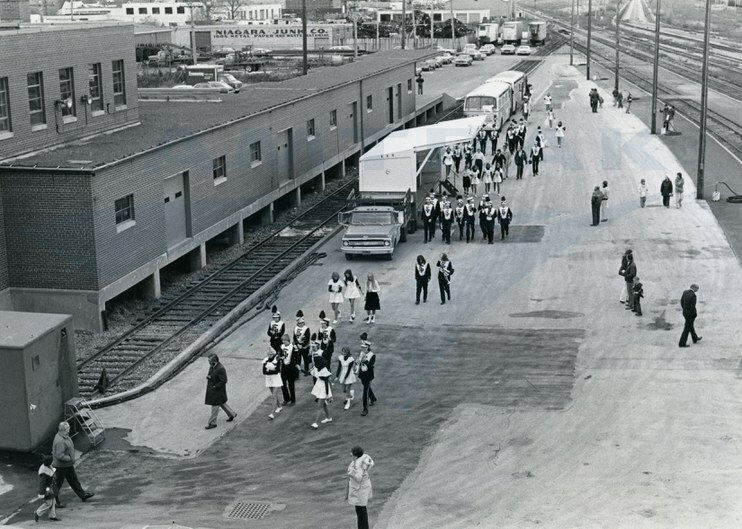 Restoration of service to Niagara Falls and Buffalo’s Exchange Street depot, as well as construction of a new station in the Buffalo suburb of Depew (intended to replace Buffalo Central Terminal), was made possible by a partnership between Amtrak and the State of New York. Under an agreement, the state provided funding for the required facilities while Amtrak operated the new service. The state, through its passenger rail program, also funded improvements to the track between Buffalo and Niagara Falls at an approximate cost of $6 million. 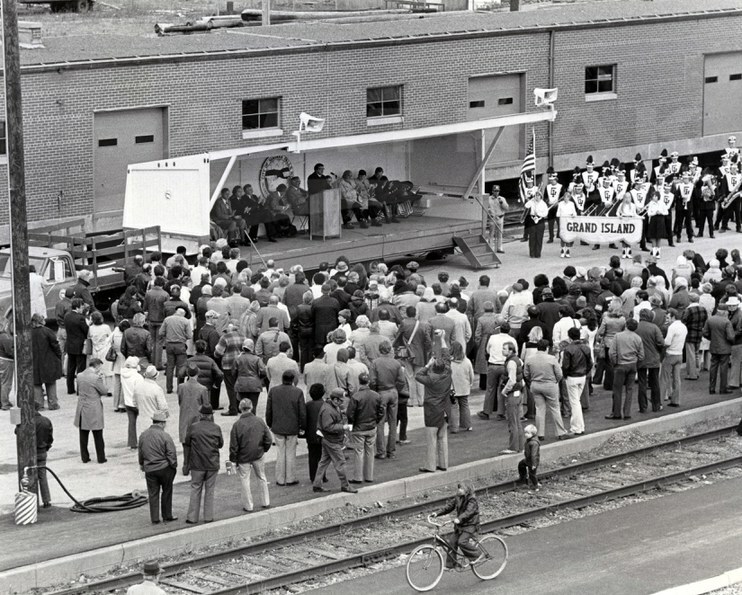 Four years earlier, the partners had worked together to restore service in the Champlain Valley with the inauguration of the Adirondack (New York-Albany-Montreal). To the left is the Lehigh Valley Railroad freight house that became the Niagara Falls station. More than three decades later, the city of Niagara Falls broke ground in August 2010 on the new Niagara Falls International Railway Station and Intermodal Transportation Center. Located along Main Street closer to downtown, the facility incorporates an 1863 U.S. Customs House and an adjacent, new building. The historic customs house will contain an Underground Railroad Museum and a Department of Homeland Security Customs and Border Protection unit, while the new structure will include a passenger waiting room and possible retail uses. The overall project also includes upgraded tracks and signals and a dedicated passenger rail siding. When completed in 2016, the station will serve Amtrak, local buses, taxis and shuttles. In fiscal year 2013, more than 32,000 travelers began or ended their journeys at the present Niagara Falls station, which is served by Empire Service trains (New York-Albany-Niagara Falls) and the Maple Leaf (New York-Niagara Falls-Toronto). Including the Lake Shore Limited and Maple Leaf, the Empire Service corridor offers three daily round-trips east of Niagara Falls, four east of Buffalo, six east of Schenectady, and 12 south of Albany to New York. The operations of Empire Service trains and the Maple Leaf are supported by funds made available by the New York State Department of Transportation.